As a veteran, I often joke that my military experience is hard-coded into my genetic makeup. It’s become an undeniable part of me – but please remember that it does not define me. OK, so I don’t like going to the movies because, as soon as the lights go out, I’m aware of every single noise and movement in the darkness (which makes it hard to enjoy the film). OK, so I’ve been known to scratch my head when observing people walking on the lawn in random directions with no apparent goal or regard to situational awareness. But that’s not the whole me. Yes, I have a lot in common with my fellow veterans and active-duty service members: a fierce loyalty, an unspoken understanding of our shared experience, iron discipline and a laser-like focus, and a strong sense of mission. There are also things that I share with civilians: I’m a dad and a husband, I taught history to high schoolers, I am addicted to reading good books, I appreciate decent shawarma, I’m fascinated by other cultures, and I love learning. If you’re a veteran or active service member, don’t assume you can’t get along with your civilian classmates. If you’re a civilian, don’t assume you can’t get along with your military classmates. At the end of the day, we’re all students, we’re all here to learn from each other, and we’re all human beings. The college experience, whether you’re an undergraduate or graduate student, is about expanding your boundaries, sharing your experiences, finding commonality with those around you, and helping one another learn. I consider myself a work in progress, so I’m happy to share some observations. To my veteran peers: Yes, many of us are used to a strictly structured day, filled with discrete, defined activities that serve a larger purpose. The school experience may feel a little chaotic and arbitrary at times. But remember that your discipline, leadership abilities, and excellent team skills are huge assets in the classroom, and your sense of mission will guide you through. Remember, too, that this military stuff is a little alien to your civilian classmates. They’re bound to have a very vague idea of what you did in the service. At the same time, keep in mind that most (if not all) of them respect and appreciate your service. They just don’t know how to talk about it. So, when the subject of your military service comes up, it may meet with an abrupt change of topic, nervous giggles, inappropriate quotes from “Full Metal Jacket,” or even a “thank you for your service” followed by an awkward pause. Or really bad questions – you know what I’m talking about. To my civilian peers: Please don’t ask me about firing my weapon, or request a harrowing combat story. Don’t assume that a veteran has a specific political affiliation, is “damaged,” has post-traumatic stress disorder, or has been in combat. You could be talking to someone who served as an engineer, translator, drone operator, medic, IT professional, or even musician. He or she may never have even deployed to a combat situation. So please don’t toss around words like “warrior” and “hero.” Not everyone feels that those terms describe them. Feel free to ask veteran classmates about their jobs and experience, though – what they did on a daily basis, the places they visited, interesting people they met, the cultures they encountered. What would you want someone to ask you? There are so many other things you can talk about, too: their hobbies, their family, their interests. Or you could talk about the classes you’re taking, like you would with any other student. Veterans and non-veterans: Get to know one another. I’ll admit that, when I started college, at first I simply ignored everyone except my fellow veterans. That didn’t last long before I realized that, to truly enjoy myself, I had to open up to other types of students. Don’t get me wrong. It’s fine for veterans to hang with other veterans – we have an undeniably deep bond, and sometimes it really feels good to be with folks who share that. I’m just saying: Don’t do it all the time. The conversation went on from there, and led to many other conversations with many other classmates. Bridging the gap isn’t always easy. There were times when I’d be trying to listen to my professor, while other students were goofing off. There were times when I had to rush off to my day job so that I could support my wife and kids, while my classmates were spending hours drinking beer and playing video games. But remember: Each of us has our own challenges and strengths, each of us has merit, and each of us has something unique to share. So, the next time you’re wondering how to connect with a veteran, invite him or her out for coffee. Talk. Learn from each other. The conversation continues from there. 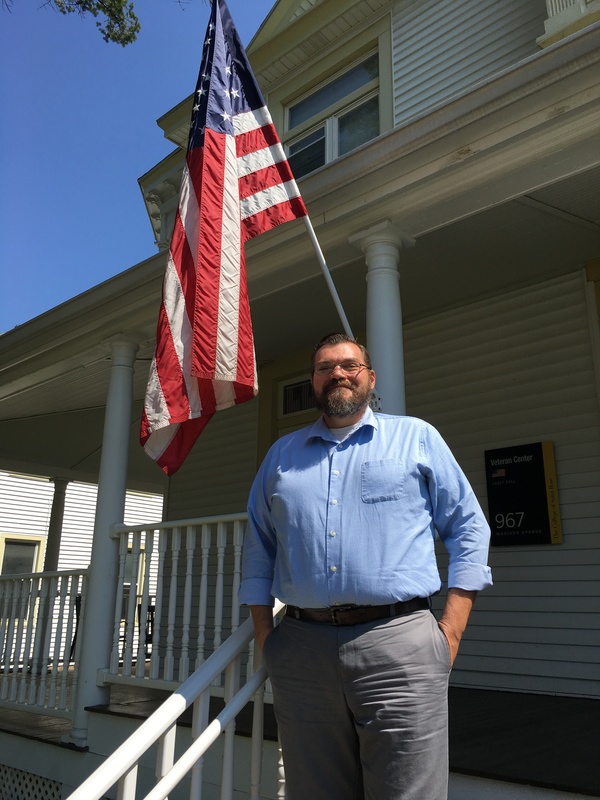 Nick Lanier, assistant director of veteran recruitment and enrollment at The College of Saint Rose, is a U.S. Army combat veteran who deployed to the Korean DMZ and Iraq, retiring as a noncommissioned officer in 2012 after 13 years of military service. A former U.S. history and social studies teacher, he holds a B.S. in political science, international relations, and history from Saint Leo University. He also has four young and energetic daughters.